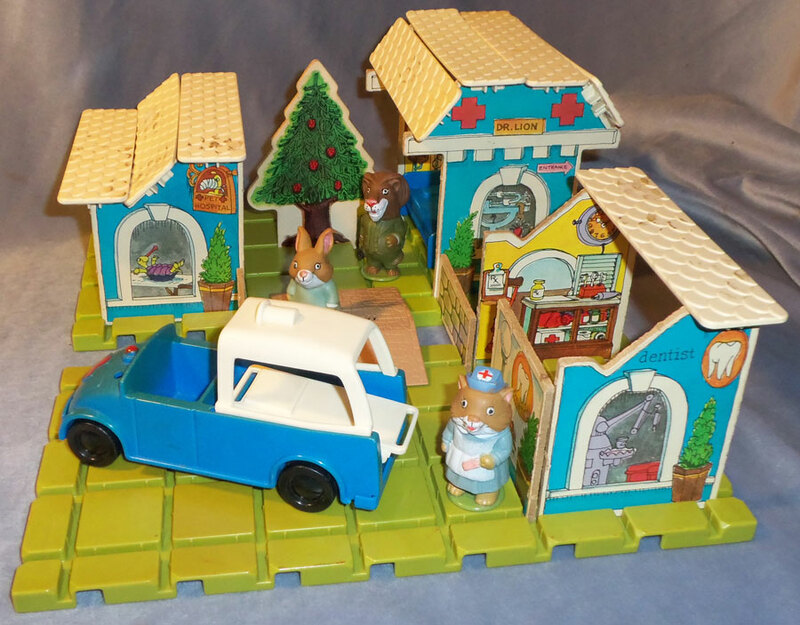 Description: The Richard Scarry Playskool Puzzletown series is considered one of the most creative playset series available in the 1970's. 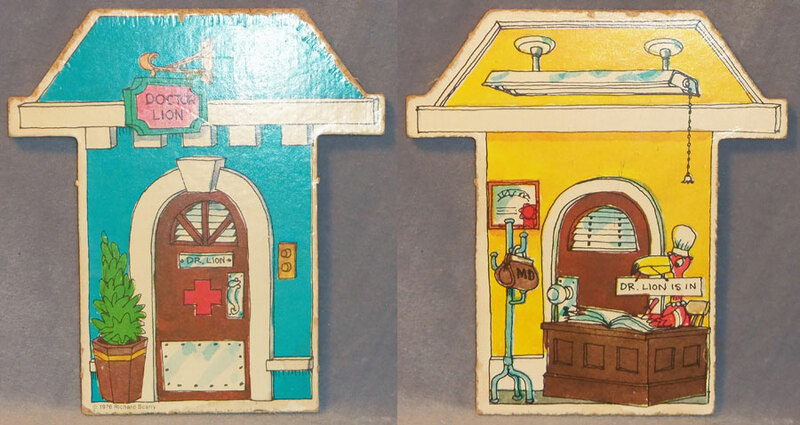 Each puzzletown set includes woodboard "wall" pieces and roof pieces that can be assembled in a vairety of ways to build different playsets. Dr. Lion's Medical Center includes medical-related building walls, an ambulance, stretcher, and 3 figures: Doctor, Nurse, and Patient. 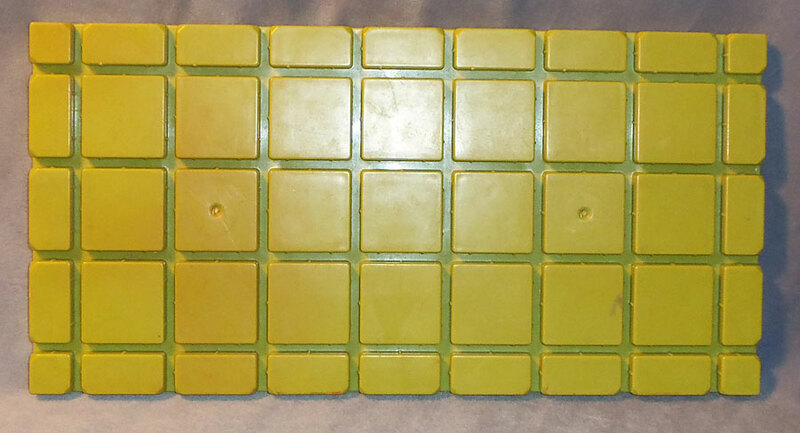 2 each - PSK188 - Playboard Base - Rectangular green hard-plastic playboard base with raised squares creating grooved lines (furrow or "ditch") to support Decorated Woodboard (Puzzle) Pieces. Has 4 long grooved lines and 8 short grooved lines. The outside edge squares have a small square hold in the bottom left corner (to attach road/ramp pieces). Measures 12" long x 6" wide x 3/8" tall. 2 each - PSK189 - Ramp - Tan (light brown) hard-plastic road ramp with a rock-simulated pattern on top. 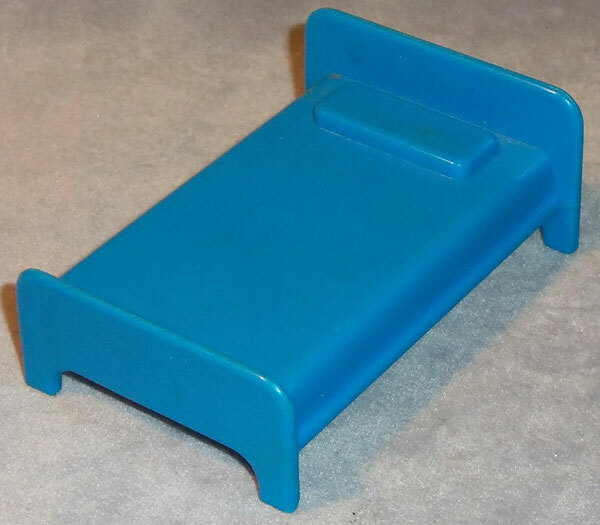 The tallest end of the ramp has an extended c-shaped clamp (to attach ramp to playboard base or to connect 2 ramps together to make a bridge). Measures 3" wide x 2-3/8" long (including c-clamp) x 1/2" deep. 8 each - PSK190 - Roof Piece - WHITE rectangular hard-plastic roof piece with rounded scalloped roof shingles molded on one side and a raised "grid" on the other side. The "grid" is one long line with 4 equally spaced + shapes. 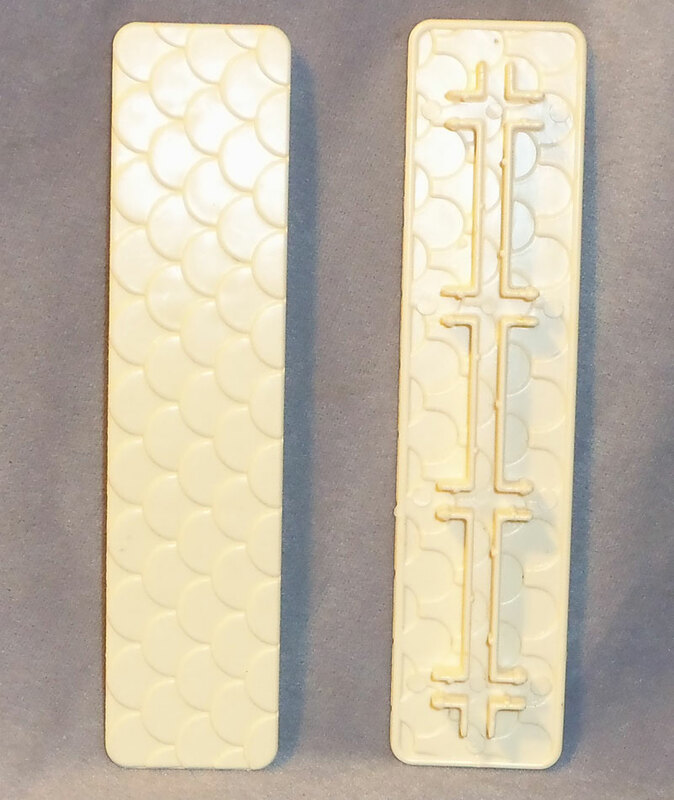 Measures 5-7/8" long x 1-3/8" wide x 3/8" thick. PSK191 - Dr. Lion's Office Door - Blue exterior with pink sign above door marked "Doctor Lion". Yellow interior with a bird sitting at desk, bird has sign in mouth marked, "Dr. Lion Is In". 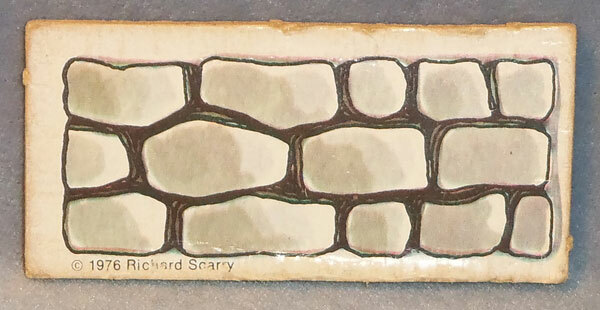 Measures 5-1/2" tall x 5" wide. PSK192 - Dr. Lion's Office Window - Blue exterior with pink arrow marked "ENTRANCE", mouse in wheelchair under window. Yellow interior with mouse sitting on stool (mouse leg in cast). Measures 5-1/2" tall x 5" wide. PSK193 - Eye Doctor Window - Blue exterior with eye-glass shaped sign marked, "eye" in one lense and "dr." in other lense - has mouse with large glasses standing on window seal. Yellow interior with shelves of glasses, eye-testing equipment and a red stool. Measures 4-1/8" tall x 3-1/4" wide. 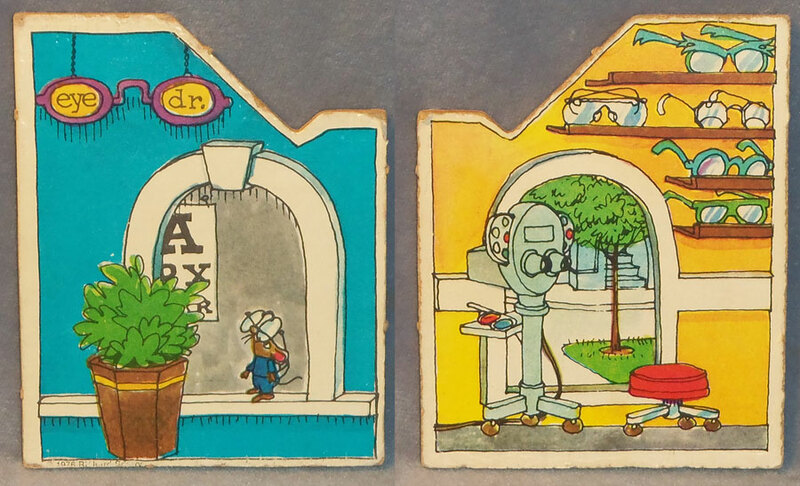 PSK194 - Eye Doctor Wall - Square wall with purple eye-glass shaped sign and marked, "EYE DOCTOR" in red - Has a blindfolded mouse running on ledge. Yellow interior wall with picture of cat wearing glasses on wall above blue counter - has glasses and lense on top of counter. Measures 2-7/8" square. PSK195 - Dentist Window - Blue exterior showing purple dental equipment inside window and an orange oval sign with a white tooth above a potted plant. Yellow interior with red dental chair and purple dental equipment. Measures 4-1/8" tall x 3-1/4" wide. 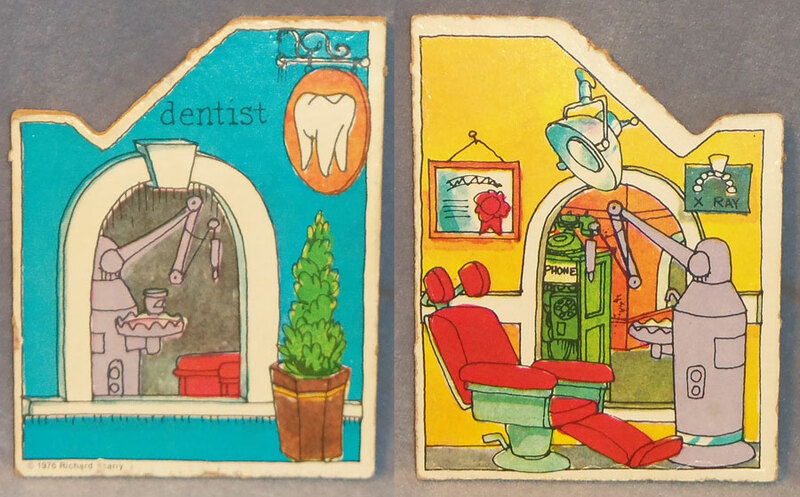 PSK196 - Dentist Wall - Square wall with round orange sign with a white tooth and marked "Dentist" - Has a mouse carrying a big red toothbrush running on ledge. Yellow interior wall with 2 picture of animals with big teeth on wall above a green counter - has dentures and sink on top of counter. Measures 2-7/8" square. 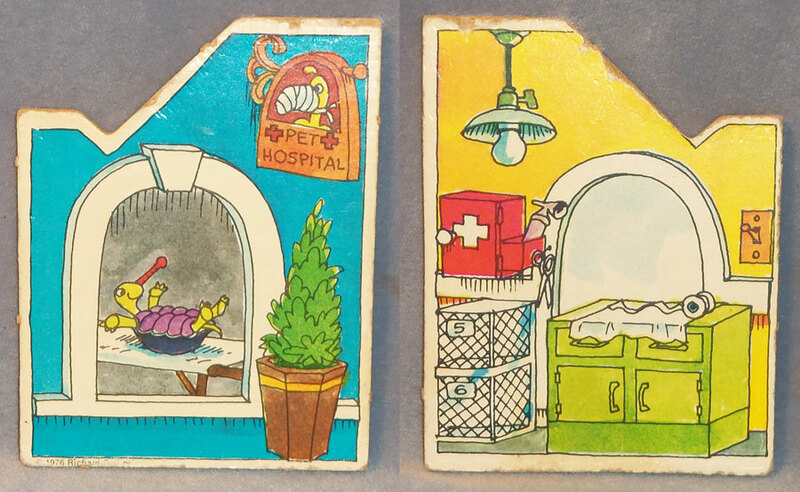 PSK197 - Pet Hospital - Blue exterior wall with window showing turtle on stretcher - has orange sign above window marked "PET HOSPITAL". Yellow interior with green counter under window, red medical box on wall, and stacked cages on floor. Measures 4-1/8" tall x 3-1/4" wide. 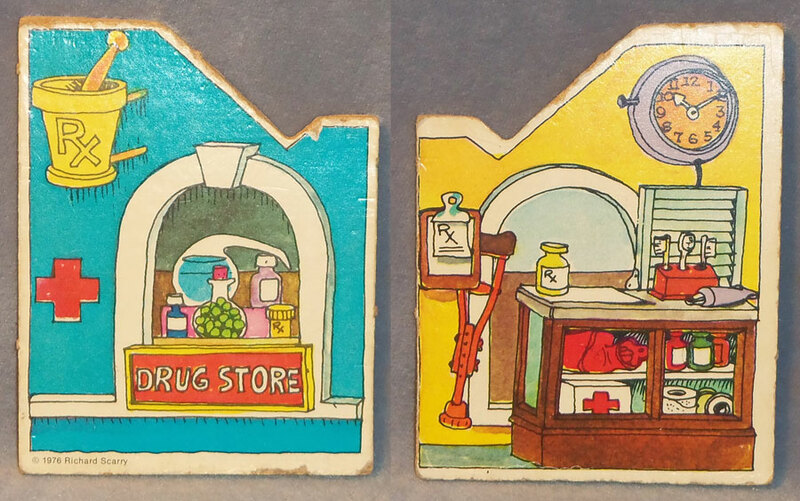 PSK198 - Drug Store - Blue exterior wall with window showing medications on shelf inside - has yellow RX sign above window and red sign under window marked "DRUG STORE". Yellow interior with brown counter under window - has medical supplies on shelves under counter, toothbrushes, toothpaste, green RX bottle on top of counter, crutches and RX pad on wall. Measures 4-1/8" tall x 3-1/4" wide. 2 each - PSK199 - Short Rock Wall - Short grey rock wall (same design on both sides). Measures 1-3/8" tall x 2-7/8" wide. 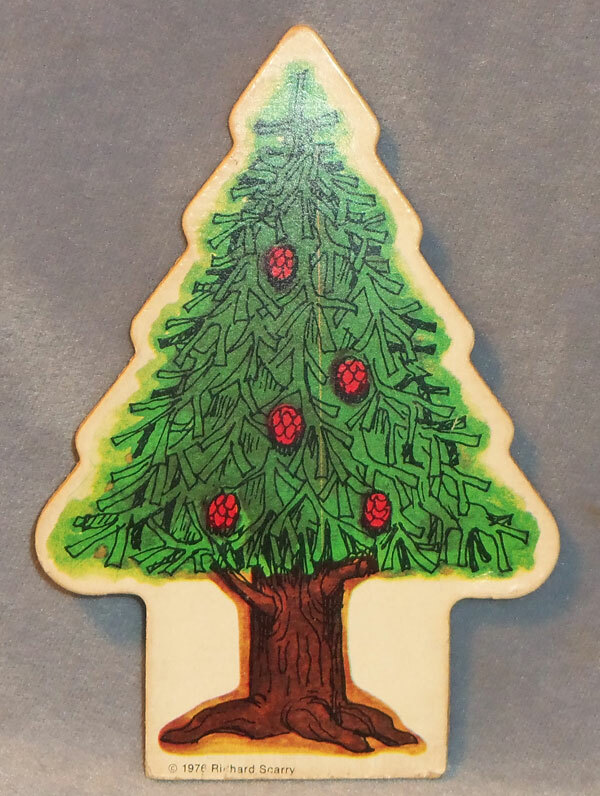 PSK200 - Pine Tree - Green tree with brown pine cones (same design on both sides). Measures 5" tall x 3-1/2" wide. 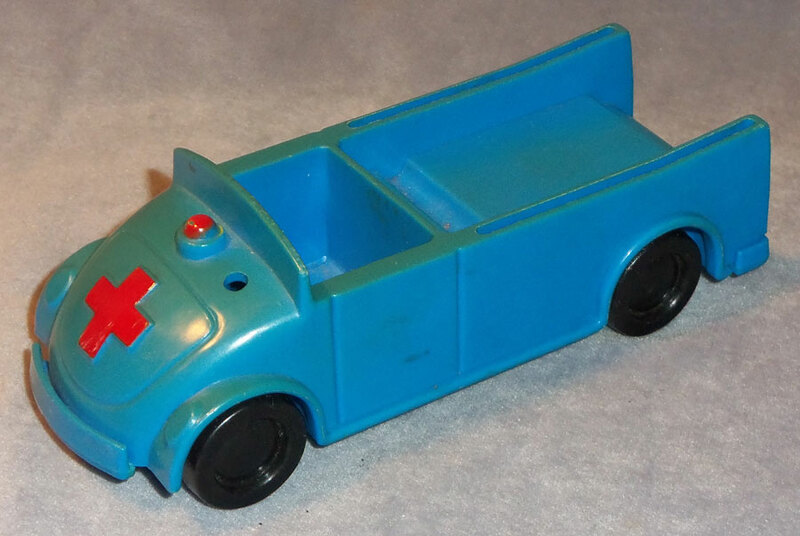 PSK201 - Ambulance - Long blue Ambulance with a squared front seat and long bed. The sides of the bed have recessed grooves (to attach the removable roof) and the top center of the bed has a small recessed groove (to help hold the removable stretcher in place). The nose of the ambulance has a red plus-shape (+) and a small red siren. 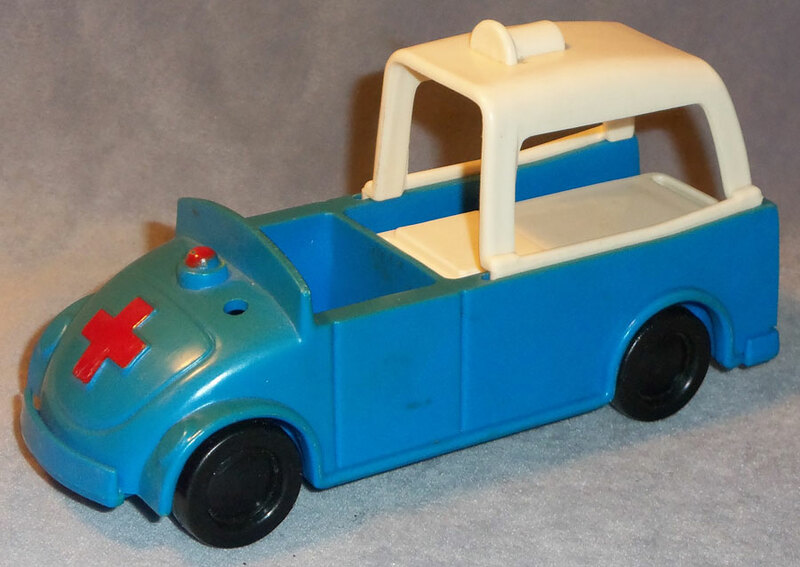 Bottom of ambulance is marked, "©1976 RICHARD SCARRY, PLAYSKOOL®, HONG KONG". Measures 6" long x 2-5/16" wide x 2" tall. 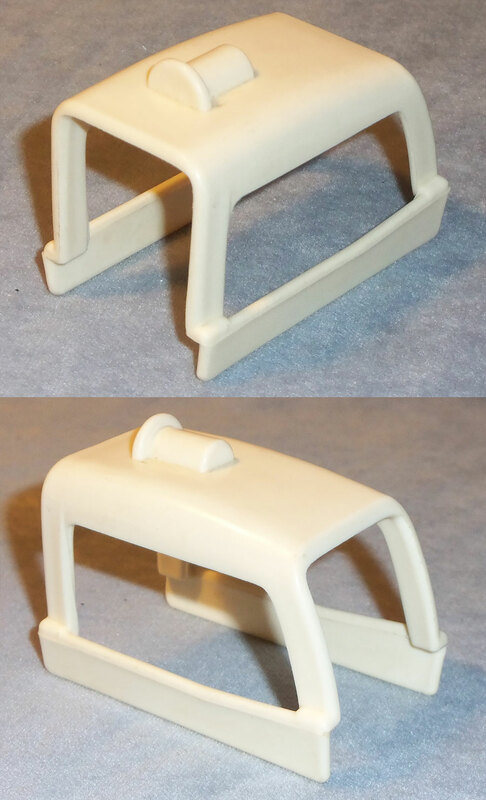 PSK202 - Ambulance Roof - White bendable plastic roof with a rectangular top and 2 flexable sides. Both sides has a rectangular "window" and bottom edge of both sides fit into grooves on the sides of the Ambulance bed. 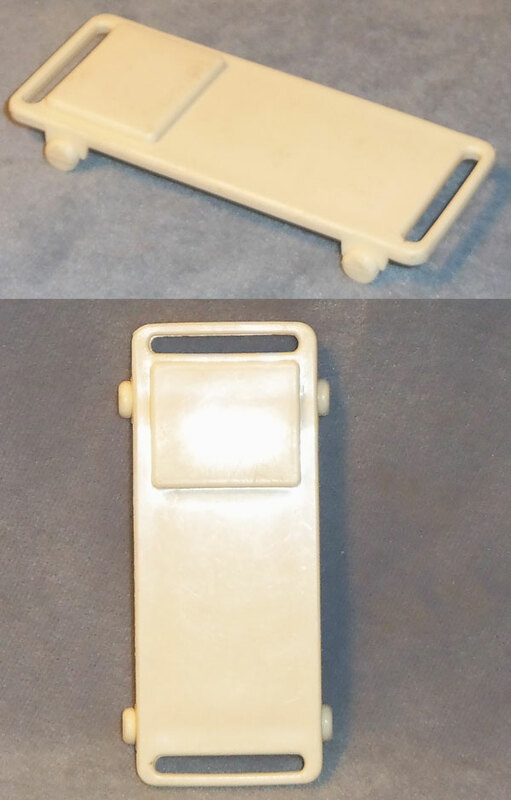 PSK203 - Stretcher - Small white rectangular stretcher with 4 wheels (wheels do not roll) and handle bars on each end. The stretcher has a slightly raised square pillow on top and is marked, "PLAYSKOOL®, HONG KONG, R091502000" on the bottom. Measures 3-1/16" long x 1-1/2" wide x 1/4" deep. PSK204 - Medical Bed - DARK BLUE rectangular bed with a headboard, footboard, and slightly raised rectangular pillow. Marked, "PLAYSKOOL®, HONG KONG, R091501000" on the bottom. Measures 3-1/8" long x 2-1/4" wide x 1-1/4" deep. *See "Variations" below. PSK206 - Dr. 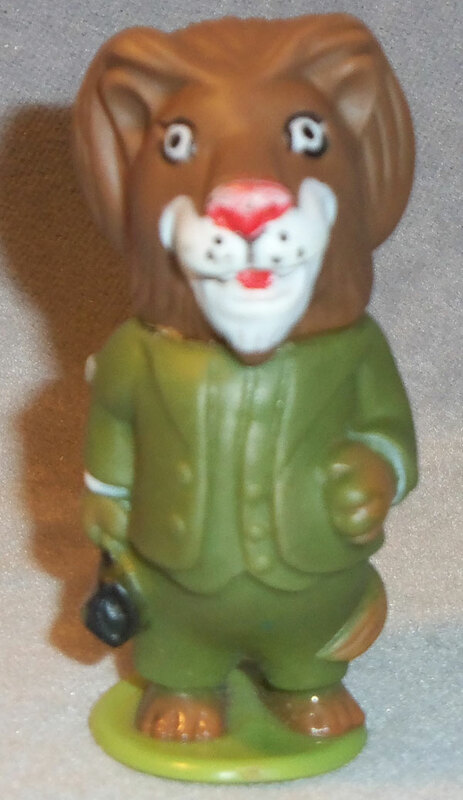 Lion - Tall lion wearing a green suit and carrying a black medical bag. 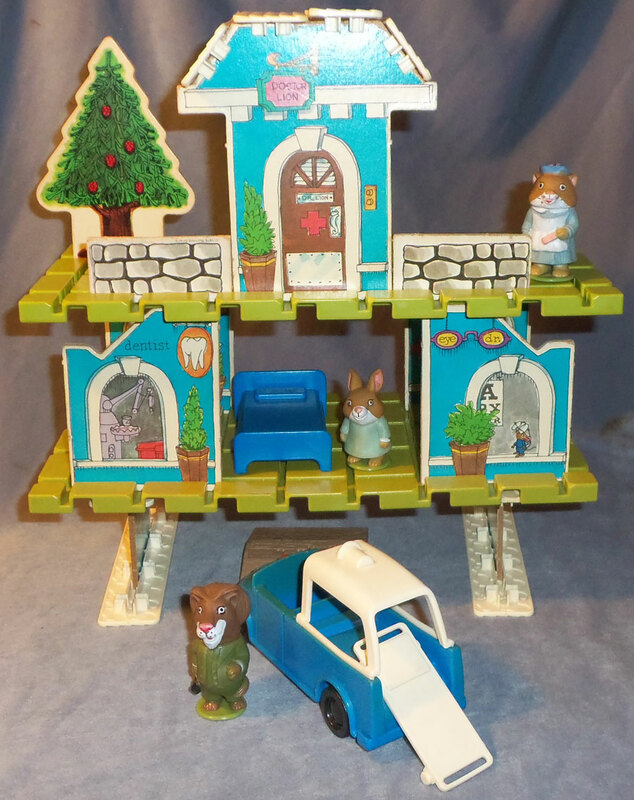 Stands on a round green base, bottom is marked, "RICHARD SCARRY ©1976, PLAYSKOOL®, HONG KONG". Measures 2-1/2" tall. 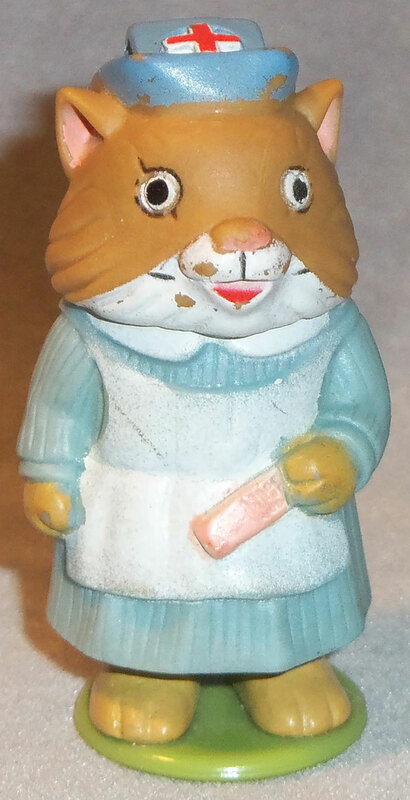 PSK207 - Nurse Nelly - Female cat wearing a blue dress with white apron, blue nurse hat (hat has red plus sign in center), and she carries a pink band-aid. 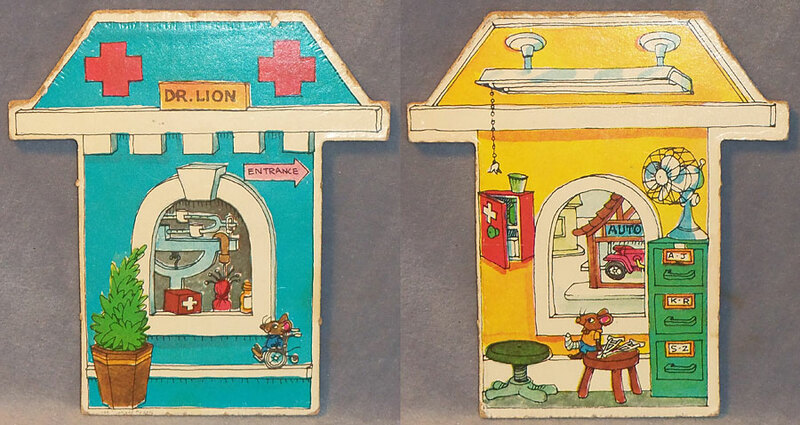 Stands on a round green base, bottom is marked, "RICHARD SCARRY ©1976, PLAYSKOOL®, HONG KONG". Measures 2-1/4" tall. WFL: 07-A2-03-4-L.
PSK208 - Flossie - Baby rabbit wearing a medical green gown with 3 white string-ties in the back. 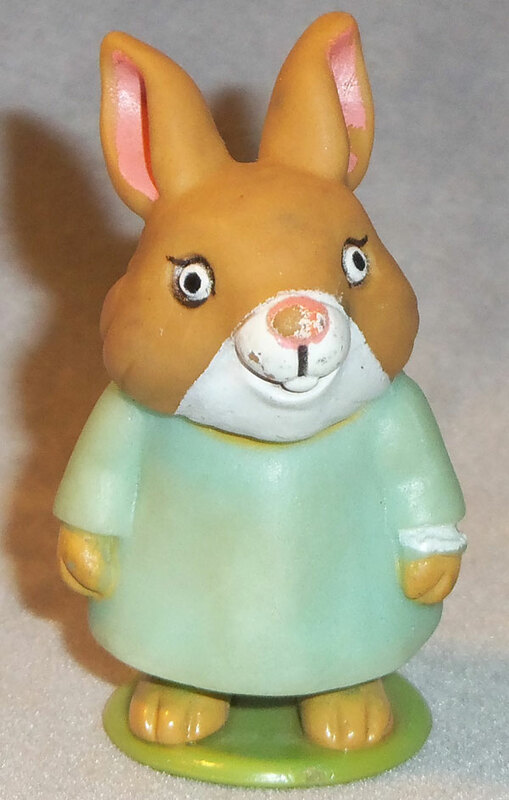 Stands on a round green base, bottom is marked, "RICHARD SCARRY ©1976, PLAYSKOOL®, HONG KONG". Measures 2" tall (to top of ears). 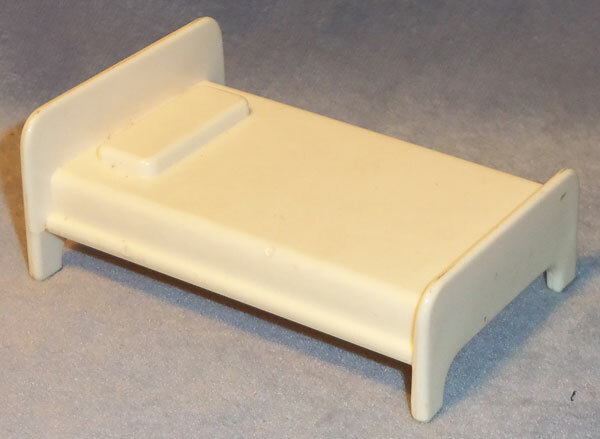 PSK205 - Medical Bed - WHITE rectangular bed with a headboard, footboard, and slightly raised rectangular pillow. Marked, "PLAYSKOOL®, HONG KONG, R091501000" on the bottom. Measures 3-1/8" long x 2-1/4" wide x 1-1/4" deep. 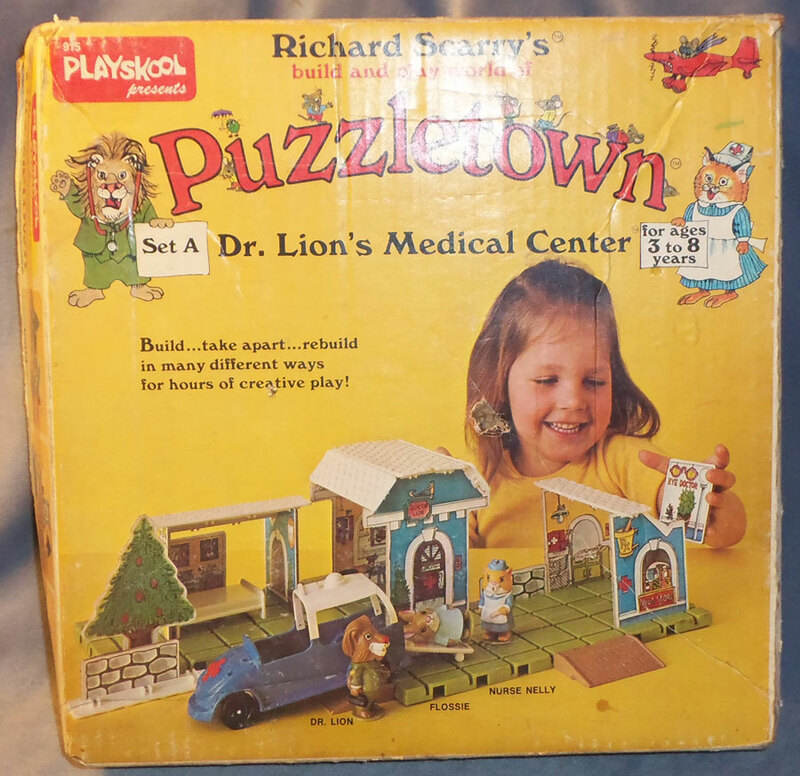 PSK210 - Box ONLY - Sold in a 12-3/4" x 12-1/2" x 3" box marked "Puzzletown Set A - Dr. Lion's Medical Center".